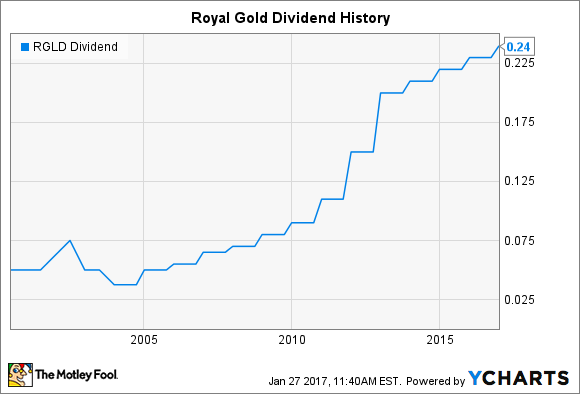 Will Royal Gold, Inc. Raise Its Dividend in 2017? The gold streaming company has an impressive track record of dividend growth, but will it stay strong? The mining industry isn't known as a hotbed of dividend stocks, but Royal Gold (NASDAQ:RGLD) has carved out a lucrative niche that has made income investors quite happy throughout its history. Royal Gold is a streaming company, following a business model that involves purchasing royalty interests and entering into streaming agreements with miners. This gives Royal Gold exposure to gold prices while insulating it from the operational challenges that mining companies have to deal with constantly. By growing its assets over time, Royal Gold has produced more income, and it has shared that income in the form of rising dividends. Let's look more closely to see whether Royal Gold can keep up the pace for another year in 2017. Data source: Yahoo! Finance. Last increase refers to declaration date. N/M = not meaningful; Royal Gold had negative earnings over the past 12 months. Royal Gold has executed its strategy as a royalty and streaming company to near-perfection. By building up a growing portfolio of producing assets, Royal Gold participated fully in the boom in precious metals that saw gold prices explode higher from the late 1990s to 2012. In addition to taking interests in mining operations that were already producing metal, Royal Gold also sought out development properties that would eventually evolve into producing assets. The resulting pipeline of growth has caused the company's revenue to climb at a 29% annual rate for the last decade. Royal Gold's dividends have followed suit. Starting with an annual payout of $0.05 per share in 2000, the royalty specialist quadrupled its payout by 2005 by making $0.05 per share payments on a quarterly basis. The chart below doesn't accurately reflect the changes in dividend frequency, but it does show how subsequent double-digit percentage annual increases kept lifting the total payout higher, and dividend growth dramatically accelerated in the early 2010s. Boosts of 22%, 36%, and 33% in 2010 through 2012 showed just how healthy the precious metal market was at that point. RGLD Dividend data by YCharts. Since 2012, precious metals prices have fallen dramatically, but that hasn't stopped Royal Gold from continuing to make annual dividend increases, albeit in smaller amounts. The company declared its latest $0.01 per share increase last November, taking effect with its most recent dividend payment. What could boost Royal Gold's future prospects? The most obvious thing that could help Royal Gold is for the price of precious metals to start climbing again. 2016 was a solid year for gold, which posted an 8% rise, and prices of the yellow metal have climbed slightly so far in 2017 as well. If those trends continue, then Royal Gold will stop having to take asset impairment charges and should see its net earnings return to positive territory. The prospect for rising income should have an upward influence on future dividend actions. However, one thing to note is that if the gold market rises sharply, it could spur more immediate investment opportunities for Royal Gold. That paradoxically could result in less impetus for a dividend increase in the short run, as internal investment would represent a better use of available capital. However, one would expect even better long-term growth as a result of such moves. Will Royal Gold raise its dividend in 2017? From one viewpoint, Royal Gold has already raised its dividend in 2017, because the payout declaration the board of directors made in November took effect with the company's January dividend payment. Yet barring an unforeseen collapse in the precious metals markets during the remainder of the year, it's very likely Royal Gold will make the same decision toward the end of 2017 to extend its streak of dividend increases to 18 years.